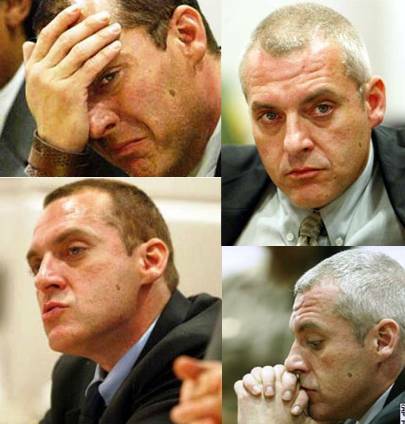 Tom Sizemore Should Be In Jail. If Paris Hilton has to do 45 days for violating her DUI arrest probation, then Tom Sizemore should have to spend at least that much time behind bars for violating his drug arrest probation. Tom Sizemore, 45, has been arrested several times before, for several things, including drugs and assault. I’m not just talking about pot and slapping people, either. The once brilliant actor is a junky and a tweeker, and very much addicted to meth, and likes to beat women. Any other person, of lesser financial capabilities would for sure be locked up by now. During his appearance in the Los Angeles Superior Court yesterday, Sizemore looked at Judge Cynthia Rayvis with tears in his eyes, and said, “If you would please just give me one more chance for myself…I can guarantee that I will give it everything that’s good about me.” And then he asked to be placed back on probation. The judge scheduled a sentencing hearing for Monday, pointing out that Sizemore “cannot successfully sustain or complete” probation. Lock him up, I say! And prosecutors agree, wanting him to serve the 16 months prison term imposed after the actor pleaded no contest to possessing methamphetamine in February 2006. That sentence was suspended and he was given three years probation, which he violated last month in Bakersfield, CA when he was found with meth in his car. Tom Sizemore has been in jail since June 5th and has pleaded not guilty to seven drug-related charges including being under the influence of a controlled substance, possession of prescription drugs without the proper prescription, and transportation and possession of methamphetamines. If convicted, Sizemore could spend up to six years in prison. I feel like at this point, hard jail time is the only punishment left for Tom Sizemore. Probation obviously isn’t working. Maybe a phone call from Robert Downey, Jr. would help too. previous post: Celebrity Babies – They’re Everywhere!